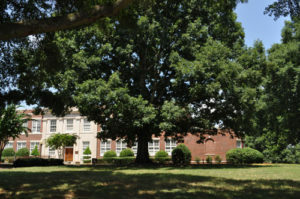 The Burgess Arboretum was built by former Reinhardt University President Dr. James Rowland Burgess. Dr. Burgess indexed more than 1,300 and planted more than 500 trees and shrubs species across the University campus. He labeled all trees and shrubs with plant labels and created an index map for the Arboretum, which is housed in the Hill Freeman Library and Spruill Learning Center. In 2007, Zach White, Reinhardt horticulturist, and the Master Gardeners of Cherokee County and the Cherokee County Extension Service began working to restore the Burgess Arboretum. Volunteers have spent hours reindexing all the trees and shrubs in the Burgess Arboretum, creating new plant labels, planting new plant species, and creating the 125 Most Noble Trees and Shrubs Plant Walk in the Arboretum. The Burgess Arboretum celebrated its grand opening in 2009 on Alumni Day.